Enjoy two of everyone's favorites—pizza and pasta—in one delicious Deep-Dish Pizza Casserole recipe. 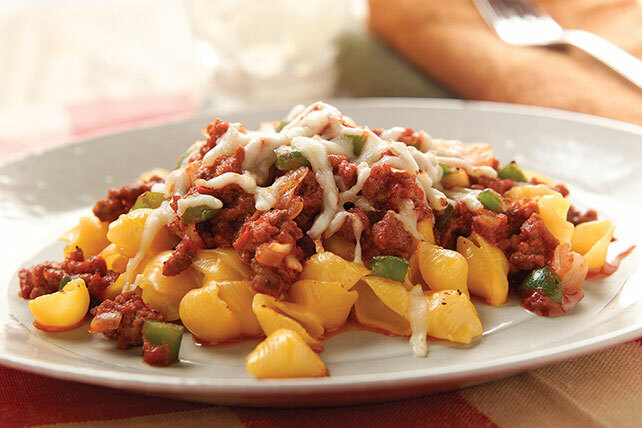 Try this pizza casserole recipe for weeknights. Prepare Dinner as directed on package. While Macaroni is cooking, brown meat with peppers and onions in large skillet; drain. Stir in pizza sauce. Spoon Dinner into 8-inch square baking dish; top with meat mixture and mozzarella. Cover. Substitute ground turkey, ground round or ground sirloin for the ground beef.